James Lynch’s video works have the nagging insistence of a recollected dream - worlds populated with people toiling through pointless actions, dislocated bodies wandering in faraway places, or caught in momentary idylls. One of the most disconcerting aspects of Lynch’s videos is that they feature the artist, not as he imagines himself, but rather as his friend’s have imagined him while they slept. The scripts for many of Lynch’s meticulously realised videos are based on dreams that featured him or were about him. Using various animation techniques to bring these stories to life, Lynch’s videos are both intriguing and disturbing. The narratives are seductive and beguiling yet at the same time the animation techniques disrupt the surface of „video’ and leave the viewer in state of anxious uncertainty. What here is real? Early examples of Lynch’s cycle of dream videos such as Sean’s dream of me and Nadine’s dream of me #2 [both 2003] were explicitly posited as incomplete narratives. In Sean’s Dream of Me screen text and images explain that Sean is travelling from airport to airport. Sean is seen nervously smoking cigarettes outside the terminal of one airport, wandering through the concourse of another, sitting on a seat in a third. Eventually Sean calls James Lynch in Melbourne on the telephone. The conversation doesn’t offer an explanation of the preceding scenes, it adds to the mystery. We awoke in this barn together? and Everybody was? remained similarly obscure. In We awoke in this barn together? the main figure [Lynch] awakes in a hay loft, opens a door, looks outside, closes the doors, then begins a series of chores – raking hay, carrying buckets, pushing a wheelbarrow. The scene cuts outside to show a herd of goats feeding with Lynch looking on. In this video, as in others, the sound track is a mix of location audio and incidental sound effects that heighten certain actions while downplaying others. Intriguingly, the “we” of the title is not explained as Lynch is the only figure seen – prompting the question, who is the “we” who awakes with Lynch? These videos ultimately defeat definitive interpretation but nevertheless endevour to include the viewer in the active role as an interpreter of their meaning. 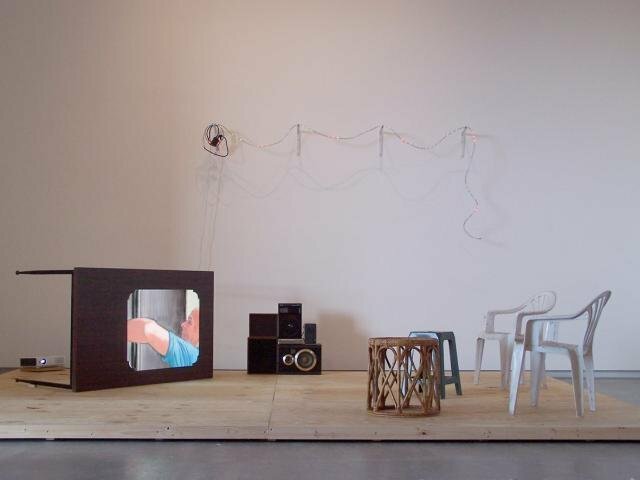 Lynch has made this seemingly contradictory concept a literal one by constructing elaborate installations for the presentation of his videos. 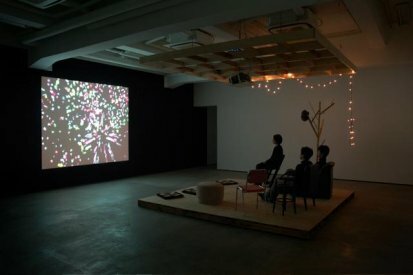 The exhibition of More Other People’s Dreams of Me from 2005, for example, positioned the audience on tiered wooden stadium-style seating to view a projection of videos while the rest of the gallery space was festooned with coloured party lights. The screening of Everybody Was in 2006 offered a collection of mismatched kitchen and lounge chairs for the audience. While such staging doesn’t offer an explanation of the work’s intention, it successfully involves the viewer in a low tech yet psychologically rich connection with the screen world. Selected solo exhibitions: The drunken soldier and other melodies, Tokyo Wonder Site, Tokyo, 2007. Chinese laundry, Uplands Gallery, Melbourne, 2007. 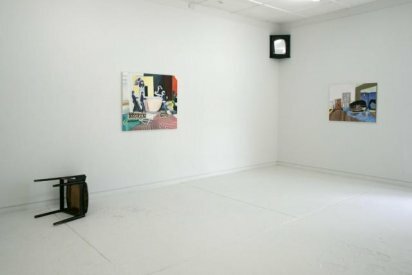 Some new paintings and a zoetrope, Uplands Gallery, Melbourne, 2005. Le Grand Café, Galerie Frank Elbaz, Paris, 2004. Let me be your fantasy, Uplands Gallery, Melbourne, Inside of me is such a part of you, Mori Gallery, Sydney, 2003. Selected group exhibitions: Uturn, Glendale College Art Gallery, Culver City, Los Angeles, Rock, paper, scissors, Westspace Melbourne, Vernacular Terrain, Queensland University of Technology Museum, Brisbane, Beijing Film Academy, Songzhuang Art Museum and Yokohama Art Museum, Chat Room, Deloitte Building Sydney, Relentless Optimism, The Carlton Hotel, Melbourne, 2007. Anne Landa Award, Art Gallery of NSW, 2006. Selected publications: James Lynch, The Age, 12 May 2007, Damp Untitled 2007, Uplands Gallery, September 2007, Beneath the Streets, Terminus Projects, Art and Australia, Summer 06-7, James Lynch U-turn, Glendale College Art Gallery, September 2007, Lynched, Relentless Optimism, Melbourne, 2007. James Lynch, Flash Art, Vol. XL No. 255, July - September 2007.